The Rhedosaurus and the Roller Coaster: Making the Beast, and Harryhausen & Bradbury: An Unfathomable Friendship, and more! This classic is a film of firsts. It spawned a new era of atomic-age creature features, including Them! and Godzilla: King of the Monsters. It was the first screen adaptation of a work by fantasy fiction titan Ray Bradbury. And it marked the first time film legend Ray Harryhausen had total control of special effects. He came up with a fantastic creature constructed at full scale (all 50 tons of it!). Full Screen Version includes behind-the-scenes archive footage on How to Operate Giant Ants, and more! 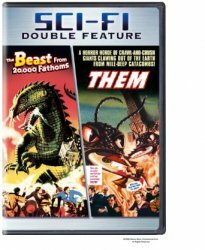 Radiation-mutated ants -- 12 feet long and capable of lifting tons -- become giant problems for James Whitmore, Edmund Gwenn, James Arness and all of Los Angeles. They're big. They're bad. They've got a serious attitude problem. You won't find a can of bug spray big enough to stop 'em!